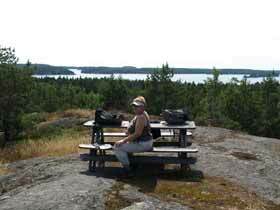 We offer both guided and self-guided hiking options throughout Sweden and also in Eastern Finland. The climate and landscape will vary greatly depending on the area you are travelling to, so this can affect when you choose to travel for your trip. 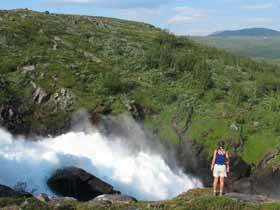 Northern Sweden offers a stunning fjäll landscape and some world-class opportunities for hiking. Summer will come much later and autumn much earlier in the north compared to further south, so the season for hiking is much shorter. 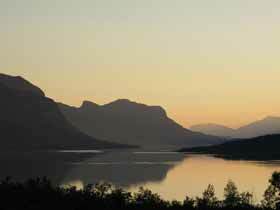 The Midnight Sun shines from around mid-May until the end of July. At this time, the sun never sets and it is daylight 24 hours a day. This is a wonderful experience, and while you may find it difficult to sleep until you adjust, you will also find that your body requires less sleep. You can be out hiking at 1am if you wish! At the other end of the spectrum, the days become much shorter as you move towards autumn and by mid-September the sun is once again setting around 7pm. 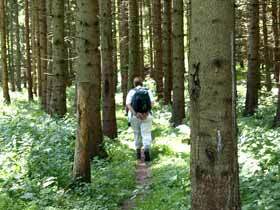 The season for hiking normally begins in mid-June. At this time there can still be snow (in 2015, after a winter of extremely heavy snowfall, the first guests of the season needed to use snowshoes for part of the trail!) and temperatures can still be in single figures. By the time summer reaches its height towards the end of July, daytime temperatures average in the high teens, but can also be much hotter and occasionally temperatures up to 30 degrees C are possible. 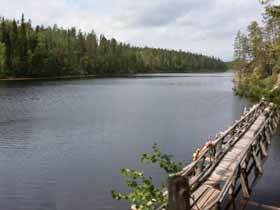 You can encounter both midges and mosquitoes in the far north (unlike further south, where only mosquitoes occur), though conditions vary greatly both from year to year and also within the season, so you may encounter more than you expect or none at all. Normally, you are likely to encounter fewer mosquitoes/midges during tours at the start and end of the season. We always recommend that you dress appropriately and take repellent to ensure your trip is comfortable and enjoyable. Read our blog article on mosquitoes for more information. For our tours on the King's Trail, the option to join a day summit tour of Kebnekaise, Sweden's highest mountain, is not available at the start and end of the season, as weather conditions may not be suitable. If you wish to make this a part of your trip, you should therefore plan dates appropriately. You can see general average temperature and other weather information for Kiruna in northern Sweden here. Note that conditions in the mountains and elsewhere in Swedish Lapland can of course vary greatly. 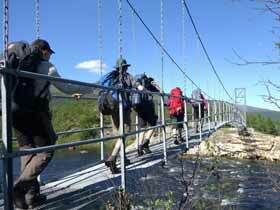 The hiking season further south is much longer, with tours possible from April/early May to end September or even into October. Conditions in April and May even into early June can still be very cool, so dress warmly, but this is a wonderful and very quiet time to be outdoors in Sweden. From early September onwards, the forests blaze with beautiful autumn colours and again you will feel that you have the whole world to yourself! During the high summer from late June to mid-August, you have long hours of daylight and typically milder temperatures. The Midnight Sun does not shine in the south, but even here for the weeks around Midsummer it hardly gets dark at all, offering wonderful possibilities to be out hiking as long as you wish. You may encounter mosquitoes (not normally midges, which are usually found further north) during your trip though as mentioned above, numbers vary greatly both from year to year and within the season. Before mid-June and from September onwards will normally have the lowest mosquito numbers. Read our blog article on mosquitoes for more information. As a very general guide, you can see average weather information for the Stockholm area here and for the Gothenburg region here. 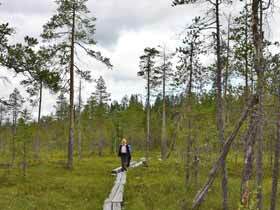 Our hiking experience in Finland, Hiking in the Finnish-Russian Borderland, offers scheduled dates in August, which is an optimum time for hiking. Private groups can arrange tours on other dates between May and September. 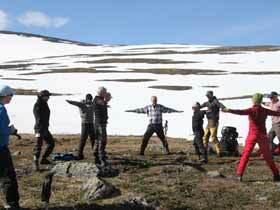 The majestic mountains of Jotunheimen, just 4 hours by bus from Oslo, is the setting for Hiking Besseggen and Jotunheimen National Park, a week-long guided tour between mountain cabins with your main luggage transferred between overnight locations by boat. As a tour in the high mountains, the season for hiking here is shorter than at lower altitudes, as snow cover can persist well into the spring. Scheduled tour run between June and August, when it is also possible to add a glacier summit hike to extend your trip.